We began as two credit unions that combined their resources many years later. 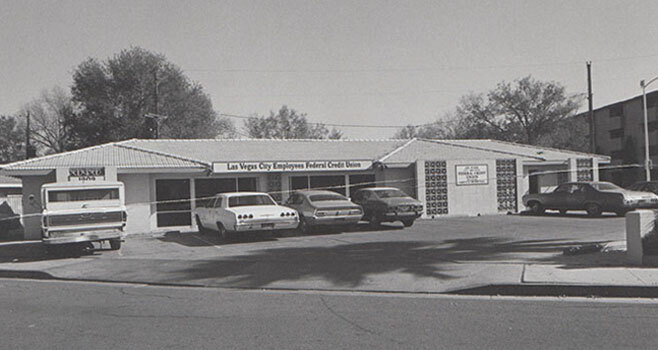 The Vegas Air Base Federal Credit Union was started on February 10, 1950, when nine civilian employees pooled $5.00 each to begin their credit union. At Las Vegas City Hall, seven City employees began the Las Vegas City Employees Federal Credit Union on February 14, 1951. By the end of 1951, the credit union had grown to 66 members with total deposits of $2,205. 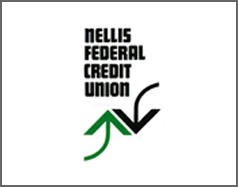 Vegas Air Base Federal Credit Union changes its name to Nellis Federal Credit Union. On August 31, 1983, the Nellis Southern Nevada Federal Credit Union and the Las Vegas Federal Credit Union merged and adopted the name Nevada Federal Credit Union. By the year 2000, we had grown to 79,000 members with total deposits of $511 million. In early 2001, we were authorized by the Federal government to serve all residents of Clark County, Nevada, regardless of their place of employment. A short time later, we were also authorized to serve all residents of Pahrump and a large portion of Reno. In 2011, with membership remaining strong and a growing number of Nevadans interested in credit union membership, the credit union board of directors proposed to convert to a State chartered, federally insured credit union. On October 3, 2011, Nevada Federal Credit Union converted to a state charter and became One Nevada Credit Union. While much has changed over the decades, the most important factors remain the same. The credit union is a not-for-profit cooperative, owned by its member depositors, and led by an unpaid volunteer Board of Directors who are elected by and from the membership. The credit union was formed solely for the benefit of its member-owners for the purpose of providing the very best service, rates and products. That commitment remains our focus to this day! We had a very humble beginning. As with most credit unions, a small group of people pooled their funds to create a source for loans. Those same people volunteered their time to nurture, manage, and direct the affairs of their fledgling cooperative. The credit union you know today as One Nevada Credit Union as two credit unions that combined their resources. 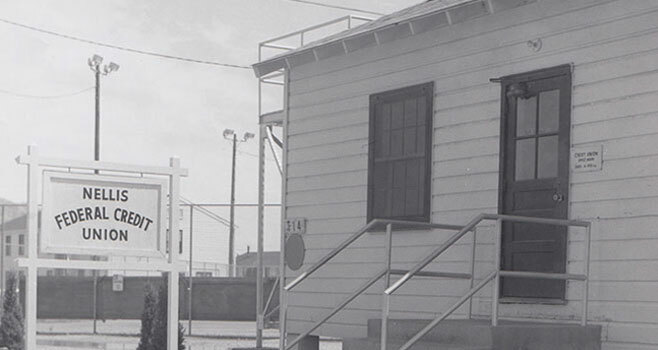 The Vegas Air Base Federal Credit Union was started on February 10, 1950, when nine civilian employees pooled $5.00 each to begin their credit union. By the end of 1950, the credit union had grown to 77 members and had total deposits of $1,807. 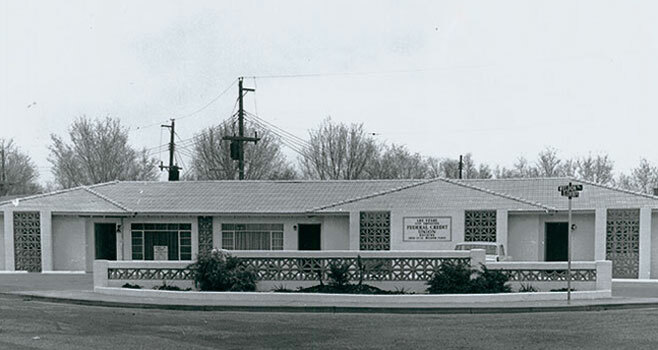 In 1958, the credit union changed its name to Nellis Federal Credit Union. Meanwhile, down at Las Vegas City Hall, seven City employees began the Las Vegas City Employees Federal Credit Union on February 14, 1951. By the end of 1951, the credit union had grown to 66 members with total deposits of $2,205. For the next 30 years or so, both credit unions served the employees of their respective employers and their families. Both credit unions grew and expanded their services. In the early 1980s, a change in federal regulations allowed credit unions to serve more than one employer. Both credit unions embarked upon expansion efforts to diversify their membership, offer additional services made possible by increased resources, and enable more consumers to participate in anot-for-profit member-owned financialinstitution. During this time period, both credit unions changed their names to reflect this expanded membership base. Nellis Federal became Nellis Southern Nevada and Las Vegas City Employees became Las Vegas Federal Credit Union. During this time, service was extended to many major employers, including several hotels, other local and federal government entities, and private employers. Service was also extended to a number of major employers in Reno. The credit union’s service to most of these employers has continued to the present. On August 31, 1983, the Nellis Southern Nevada Federal Credit Union and the Las Vegas Federal Credit Union merged and adopted the name Nevada Federal Credit Union. At that time, the newly combined entity had 57,000 members and total member deposits of $106 million. The minimum deposit required to join the credit union remained only $5.00. We continue to serve a number of designated employers, including the original employers, Nellis Air Force Base and City of Las Vegas. 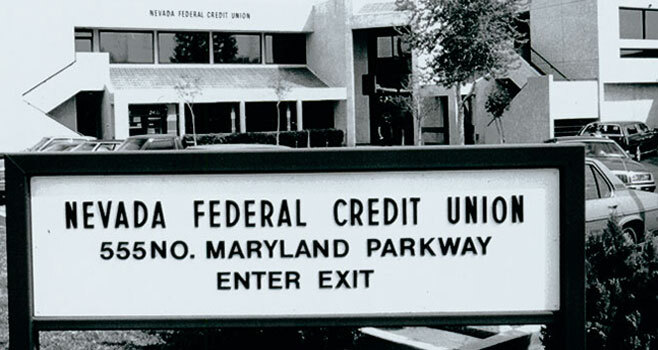 During the 1980s, several smaller credit unions joined forces with Nevada Federal so that their members could enjoy the benefits of a larger credit union. Those smaller credit unions include the Showboat Credit Union, the Commercial Center Credit Union, the Nevada Air Guard Credit Union, the Washoe State Employees Federal Credit Union, the North Las Vegas City Employees Federal Credit Union, the Vegas Village Credit Union, the Tropicana Employees Federal Credit Union, and others. By the year 2000, we had grown to 79,000 members with total deposits of $511 million. In order to make credit union services available to more consumers, in early 2001, we were authorized by the Federal government to serve all residents of Clark County, Nevada, regardless of their place of employment. A short time later, we were also authorized to serve all residents of Pahrump and a large portion of Reno. In 2011, with membership remaining strong and a growing number of Nevadans interested in credit union membership, the credit union board of directors proposed to convert to a State chartered, federally insured credit union. As a federal credit union, membership was restricted in certain areas of Nevada. A state charter would allow the credit union to add additional service areas to the existing field of membership. 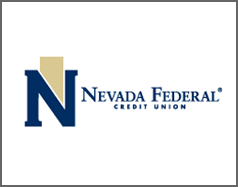 Members approved the proposal and on October 3, 2011, Nevada Federal Credit Union converted to a state charter and became One Nevada Credit Union. Membership is now open to Clark County, Nellis Air Force Base, Washoe County and Nye County, Nevada. Adding additional service areas enables the credit union to grow and generate additional revenues, which can be used to enhance member services. This membership structure remains in effect today. Additionally, the credit union continues its close relationships with the large employers it has served for many years.